No Man’s Sky was no winner for DAVID BUTTERFIELD first time around. Three updates on, he revisits the game and finds a game that’s come in from the cold. It’s been more than 650 days since No Man’s Sky lurched onto the PS4 and Windows then collapsed into a heap. 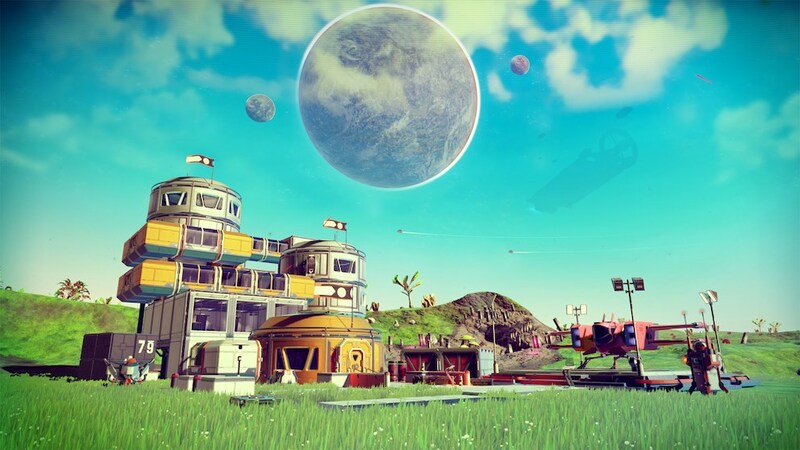 Since then Hello Games have given the game no less than three major updates and, with a fourth on the horizon, I think it’s time to revisit this incredibly divisive game. I was one of the ‘lucky’ ones. No Man’s Sky actually launched first time once it had invaded my PC. For the first 30 minutes it truly was the shiny new toy de-jour – but it rapidly outstayed its welcome. After gathering enough materials to repair my ship and finally taking flight, NMS version 1.0 suddenly revealed itself: An indie game whose developers had overreached and, even more disappointingly, oversold what this game was. I flew from planet to planet in the galaxy and frowned at how alike every one of them was. “Perhaps the devs purposefully made a single galaxy’s planets look the same as shorthand to identify individual galaxies,” I thought. Oh, poor naïve gamer that I am. No, every planet looked like a flat, vaguely rocky moon with the occasional clump of trees. Not just the planets, but the flora and fauna were worryingly familiar. In fact, despite all the updates, I know when I land on a new planet and wearily step onto its surface, there’s a more than 75 percent chance I will run into the same six-legged scorpion/spider thing that makes a noise like a cartoon monster knock-off. There was little to do, too: Grind items, upgrade your suit or weapon then wander around in space until you either died of boredom or let one of the randomly generating space pirates blow you up. All of this left me very disappointed. I played for a few more hours then gave up. Hello Games went dark. Gamers moved on, and I almost forgot all about that space exploration game I desperately wanted to like. 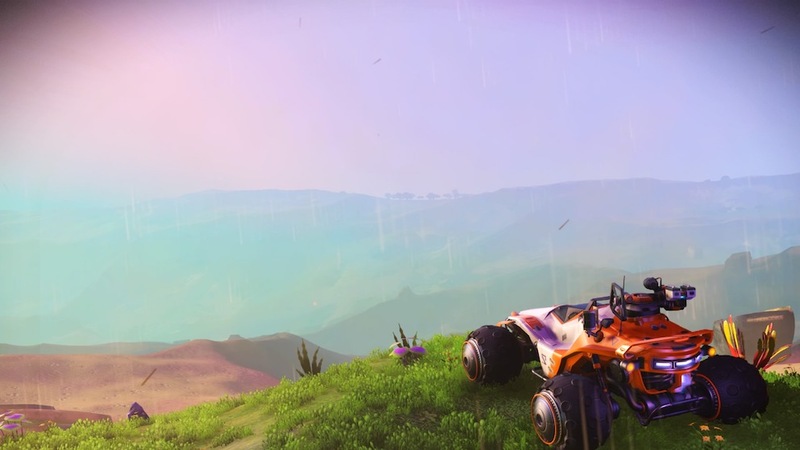 I felt that I was done with NMS – but, happily, it seems Hello Games were not done with us yet. Those three updates I mentioned? They have utterly transformed the game. With each change, I watched in astonishment as almost every aspect of the game got overhauled. Suddenly flying your ship was rewarding, heck, fun even. The graphics got a major re-do, with everything looking much more natural and organic. Features promised pre-release (and some surprises) appeared – the bare bones of multiplayer, freighters, better space combat, more varied biomes. For me though, the biggest treats were the cornerstone features of the three updates: base building from Foundation, planetary vehicles from Path Finder, and finally a true single person campaign from Atlas Rises. Base building, especially when playing in the everything-is-free Creative mode, is a joy. Every time I find a new planet with a peaceful climate I’ll build a new base and challenge myself to build a work of art. The new land vehicles are fun to drive (if ultimately pointless) and help remove a lot of the tedium of getting around an area. Finally, the campaign. I’ll be upfront – it doesn’t all work. The characters the player interacts with seem two dimensional more often than not, the story is diverting enough but to the average gamer the lore can be overwhelming to the point of confusion and, honestly, I think The Matrix did this simulacra nonsense better 20 years ago. Despite all this, actually having a purpose in this universe is remarkably exciting and the 30 hours or so of story just flew by for me. So, all those updates have brought us to the point where NMS should have been, 650-something days ago. It is now a solid game, with lots to do, with or without the story. I am full of anticipation for the next update, imaginatively called the NEXT update which hits PS4, PC and, for the first time, Xbox One in July. HG have said little about what is coming except that it’s the biggest update yet. They certainly have my attention now. No Man’s Sky is truly the game that came in from the cold. 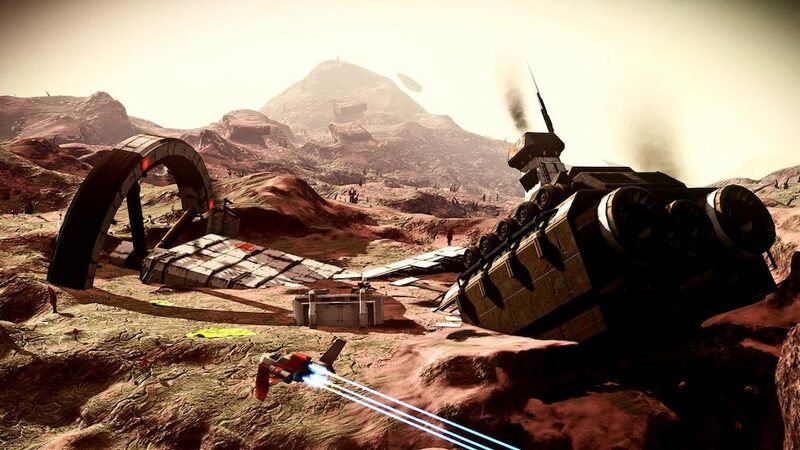 It launched buggy and incomplete, with near universal derision but Hello Games took that all on the chin and dished out update after update, patch after patch to make a satisfying, albeit somewhat clumsy procedurally generated space exploration game. If you gave up on NMS not long after launch, I say it’s definitely time to check it out again.